Soccer Penalty Kicks is kid friendly and so easy to control that anyone can play! 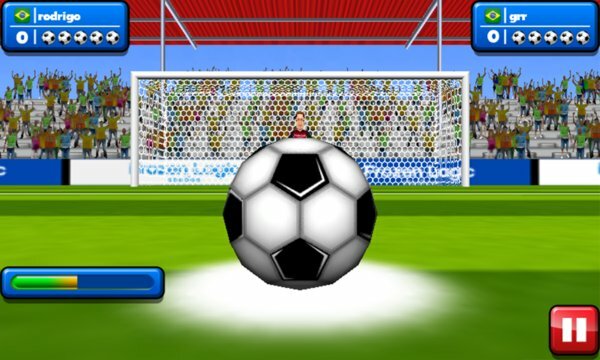 Just tap the screen to choose your direction and then tap it again to kick the ball. Each side you tap will add an effect to the ball, allowing you to add a curve effect to your kick or aim for the very edge of the box, always doing your best to dodge the goal keeper’s defense as you go! With three different play modes, you can choose what better suits you. Quick Match will let you play offline against the computer, great for practicing. In Online Cup, you enter a knockout competition and winning every round grants you the gold medal. Lastly with Ranked Match, you play for points, winning will grant you 15, losing will cost you 10 and the more points you have, the higher you will be in the worldwide ranking! So pick up Soccer Penalty Kicks now, give it your best shot and score!